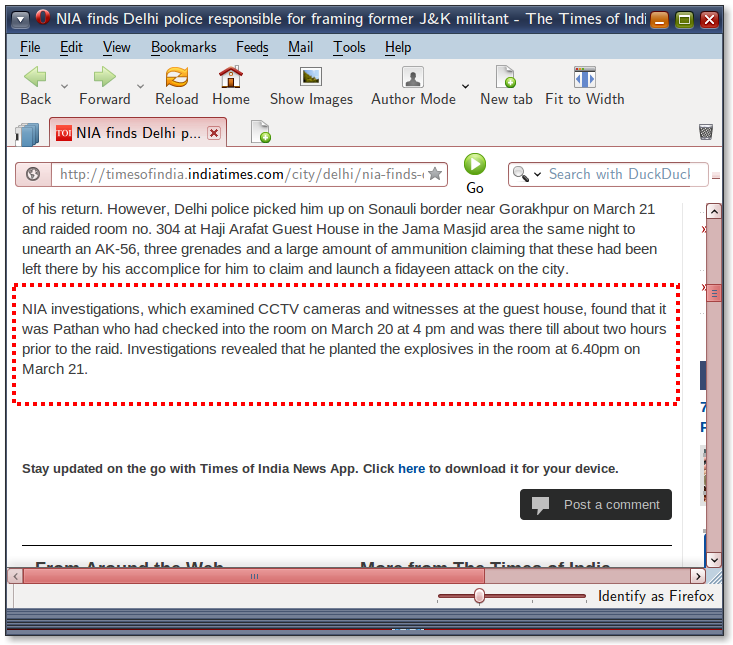 CCTV footage shows Delhi Police guy planting explosives in Delhi as part of JK returning-terrorist frameup! This pathan guy is not going to show up alive. By the time NIA gets to it, the Special Cell of Delhi Police would have had plenty of time to remove evidence that he ever existed. It was not that NIA had done some real investigative work. It was sheer incompetence (the bane of Indian bureacracy) of the Special Cell (SC) of Delhi Police that they got caught. Last paragraph of news item hides the real headline. Only Indian journalist Syed Mohammed Ahmad Kazmi has been officially charged in the case – according to police, Kazmi confessed to helping officials from Iran plan the bombing plot in return for payments totalling US$5,500. The treatment of Irani and the other Iranians as suspects also depends very heavily on “disclosure statements” supposedly made by Kazmi but denounced by the journalist as police fabrications. A central problem for the SC case is that it has no eyewitness testimony for its contention that Irani planted the bomb on the Israeli embassy car. A hotel security camera showed that Irani left the hotel the morning of the explosion wearing a black jacket. Irani had also rented a black Honda Karizma. But eyewitness Gopal Krishanan, who was driving the car that was directly behind the embassy car and thus had a clear view of the motorcycle rider when he attached the bomb to the rear of the car, said he was certain the rider had a red motorcycle and was wearing a red helmet and red jacket. The police were convinced by his testimony. Tal Yehoshua-Koren, who was injured in the attack but was able to get to the Israeli embassy without assistance, later told investigators she thought the attacker had been riding a black motorcycle and wearing a black jacket and helmet. A senior police officer involved in the case told the Indian Express, however, that Yehoshua-Koren could not be certain of the color of the motorcycle. The police claim to have recovered from Irani’s hotel room seven items on which the government’s Central Forensic Science Laboratory found traces of TNT – the same explosive that the bomb affixed to the embassy car contained. But the SC violated several police procedures in regard to that evidence, suggesting that it may have been planted by the Special Cell. It was not until February 29, 16 days after Irani left the hotel, that the room was sealed by police. Even worse, another two weeks passed before it was actually inspected by the Special Cell on March 13, according to the charge sheet. Ordinarily, the passage of that much time between the date the items were allegedly left behind and their discovery would call into question the authenticity of the evidence. On July 28, a few days before the charge sheet was made public, the manager of the hotel produced an occupancy chart showing that Irani’s room had not been used during the 16 days between his departure and the police order to seal the room. The chart, which the hotel manager had plenty of time to prepare for the police, makes the highly unlikely claim that Irani’s room was not occupied by any guest during the 16-day period. The effort to show that the room had not been altered after Irani left it still fails to address the awkward question of how so much evidence could have been found in Iranis room long after it would have been cleaned up by hotel staff. The belated occupancy chart only makes the forensic evidence claimed by the police appear even more suspicious. In the follow-up article, it just gets worse. WASHINGTON – The Delhi Police Special Cell, which has accused an Indian journalist and four Iranians of conspiring to bomb an Israeli embassy car in Delhi on February 13, has a long history of planting evidence on those it has accused and of obtaining false confessions, according to court records now cited by critics of the police unit. The Special Cell (SC) was organised in 1986 to investigate terrorism and major crimes, but it has been given such wide latitude in its operations that it has violated legal norms with complete impunity, critics say. The unit’s efforts to frame those it accuses have been so obvious – often employing the same tactics over and over again – that a significant majority of its cases have been rejected by judges in recent years. Of the 174 individuals against whom the SC has brought charges from 2006 through 2011, 119 of them – nearly 70% – have been acquitted, according to official figures obtained under India’s Right to Information Act by activist Gopal Prasad. The SC response to that development has been to leak false confessions and evidence to the news media in a largely unsuccessful effort to sway judges. A report, soon to be published by the Jamia Teachers’ Solidarity Association and a copy of which has been obtained by IPS, of 16 terrorism cases brought by the SC from 1992 to 2008 documents a consistent pattern of irregularities in police procedures that led the courts to conclude that the police had framed those who had been accused. The report’s detailed accounts of the cases are based entirely on conclusions reached by the judges in rejecting the central claims of the SC. Among the most prominent irregularities documented in the report are those relating to incriminating evidence said to have been seized from suspects and to alleged confessions. Typical of the SC terrorism cases described in the report is the case of Salman Kurshid Kori. The SC claimed that it arrested Kori and two other Muslim men as operatives of the militant Islamic group Lashkar-e-Toiba in December 2006. The SC reported seizing explosives, detonators and hand grenades from bags carried by each of the three men. But the judge for the case heard evidence that the accused had been detained much earlier than the dates cited by police. He also pointed out that there were no public witnesses to the seizure of the weapons, contrary to normal police procedures, despite the fact that a crowd had gathered to witness the arrest. Even more telling, the “seizure memo”, which should have been written at the site of the seizure well before the “First Information Report” (FIR) was filed in the case, was found to have been written in the same handwriting and ink as the FIR. Those obvious signs of police deception convinced the judge that the SC had framed the three men. The SC officer who supervised the interrogation and arrest of the three men was then-assistant commissioner of Police Sanjeev Yadav, now an Additional Deputy Commissioner of Police and in charge of the embassy car bomb case. In the 2005 case of Moinuddin Dar and Bashir Amad Shah described by Sethi, the SC claimed that the two men were Kashmiri terrorists who had come to Delhi from Kashmir carrying 450,000 rupees (US$8,000) in a car loaded with arms and ammunition, after the SC had been informed by a confidential source when and where they were arriving. Upon arrest, the two men had allegedly confessed to their terrorist plan. But Sethi recounted that the case soon fell apart in court when the judge found that the car full of arms and ammunition had been “planted” and “used as a tool to falsely implicate the accused persons in this case”. He found that the police vehicle that was supposed to have taken the police team to the site of the arrest had actually not moved that day, and that the two men had been held illegally by police in a hotel room for two weeks. After investigating another 2006 SC terrorism case, India’s Central Bureau of Investigation called for three SC officers to be charged with lying under oath and creating false evidence. But despite several instances in which courts directed the Delhi Police Commissioner to initiate legal action against officers of the SC for various abuses, none have yet been punished. Why is the Delhi Police Special Cell, Intelligence Bureau and other state police departments doing this? These frameups require quite a lot of effort. These personnel are after all like any other government employees. As any Indian knows, government employees rarely do any real work unless money is involved. Somebody is paying them huge sums of money. Who is it?